I bought some awesome posters last year from The Small Stakes and had them framed nicely for over the fireplace. I found myself on their site again recently and bought a few more, including this one, which I love. Then I got all crazy and bought this too, from Upper Playground. Only problem: framing is expensive. Mathis, our friend, neighbor and local hero, was quoted in the New York Times in William Saffire’s On Language column last weekend. Now I can add this reference to his Wikipedia entry. Read the article here. We hire lots of enthusiastic, smart young people, but sometimes they’re not born with the instinct of how to run a meeting or move a deal forward. So we end up with some convulsive, awkward client meetings where it’s not clear who is driving or what road we’re on. The way my company used to do it, we’d send newbies off to week-long intensive trainings that paralyzed them about how to actually talk to anyone, and in my mind did as much damage as they did good. Now that I’m all about the KISS (keep it simple, stupid), here’s my prescription for the smart but undertrained. Read these couple of simple steps, breathe deep, relax, and have a conversation. Start your calls by introducing everyone on the phone, and explaining their role or letting them explain it. Be brief, but don’t skip this step unless the parties all already know each other. Establish connections and rapport. Near the beginning of the call is also the customary time for folks to play the “do you know so and so” game. Anything from “We enjoyed working with your predecessor on a great program two years ago” to “I heard you were previously at Cisco; did you have a chance to work with my friend Jane?” Don’t overdo it, but pause to let him happen if it’s going to. Ask your client to talk about what he/she would like to get out of working with you. This is either very general, like “Can you tell me a little about your top goals for this year given that you have a new product coming out Q2?” or more specific, as in “I see that you have participated in events in this space before; has your goal been audience development or advertiser relations, or something else?” If you already have a pretty good idea, start by summarizing that and then checking for clarification. If you don’t know what they want but would like to lead them in a particular direction, suggest and then ask if it’s a fit. Either way, your goal here is to get the client to talk. Very important: actually listen to what they say. Repeat back to let them correct you or add a new spin to their answer once they hear it played back to them. Listen, play back, repeat. During the call, tune into your colleagues’ signals about when to keep exploring, and when to start driving towards closure. Hopefully at some point the client gives you an opening that he is buying what you’re selling. Test close some ideas and see what feedback you get. Adjust if necessary. Explain any benefits that might not be immediately obvious. Sell it in the framework of what the client said he/she needed. Listen again. When appropriate, attempt a summary of what you’ve collectively decided and articulate the next steps. Check for agreement. Listen some more. Summarize and thank everyone for their time. Remember, it’s a conversation. Your first goal is to understand the person on the other end of the line. Your second goal is to find the places where his/her goals overlap with yours. Don’t put the horse before the cart. Sorry, I am obviously addicted to putting up video this week, but this one is priceless. This is from a trip to Isham Park in Inwood at Christmas with Clementine and her cousin Kendall. Yes, Clementine is dressed somewhat inappropriately for 20 degree NY winter weather. Her choice, not mine. Apparently she knows what evil superheroes wear in NY. Clementine makes a forceful off camera appearance in this one. She is not happy that Andre is skiing better than she is. Yes, we are at Chris’s mom’s house this week as Clementine and Andre were both out of school and I thought it would be fun to take them skiing instead of juggling work and daycare options all week. They are having a blast. No, we didn’t realize when we booked this trip that it is the week of GDC, which is why Chris is not here. Back next week. This is actually the end of a much longer conversation that Clementine and Andre enjoyed after skiing yesterday. I remember when Clemmie was really little and said “hai!” instead of yes, and how sad we were when she learned the real word, so I’m secretly glad she’s so stubborn. Blocked by Websense, originally uploaded by jenpahlka. 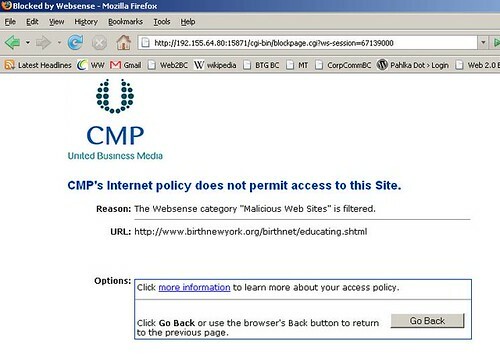 As someone who did in fact find birth a malicious trick played on women by god (okay, I’m the daughter of a midwife but I am here to tell you IT HURTS), I’m curious, How did Websense know?